This is a great way to try scuba diving for the first time! If you've never tried scuba diving before, or want to find out if you like scuba diving before starting the PADI certification course, then the Discover Scuba Diving (DSD) program is for you. You will be introduced to the amazing underwater world of Cayman Islands; which is home to some of the best Dive sites in the world. We conduct the Discover Scuba Diving day trip all year round, as we are lucky to have a constant water temperature between 26 - 28 Degrees Celsius (78 - 82 Fahrenheit) and fantastic underwater visibility. There's NO classroom work involved, NO swimming pool tests and definitely NO exams- your PADI Instructor will give you a short briefing on site or at our very own dive shop to cover important safety aspects, how the equipment works and what to expect to see under the water during the day on the coral reefs. All you need to do is relax and have fun! Here at Go Pro Diving we make safety and fun for you our main priorities. If you would like a more personal experience then we do offer a Private Instructor option for the day - where it would be just yourself and one PADI instructor on all dives. Our Discover Scuba Dive begins with a short informative talk with one of our experienced PADI dive instructors who will explain the basics - your gear, safety rules, a description of the dive site and tell you all about the fun you are going to have! Once your briefing is finished you will gear up and jump into the confined waters, which is a perfect setting to learn some underwater skills before heading out to Cheeseburg reef, which is ideal for beginner to explore astonishing coral and sponge formations and tons of colorful tropical fish! This course is available to those students who are a minimum of 10 years old, medically fit to dive and be comfortable in the water. Please review the PADI Medical Questionnaire prior to enrolling in any PADI training course. If you answer "YES" to any of the medical issues it does not necessarily disqualify you from Scuba Diving - it just means your pre-existing condition could possibly affect your safety while diving and you must seek your Physician's approval to dive. Please note that this is not a Scuba certification however it does qualify you to participate in other shallow dives with an instructor up to a maximum of 40 ft.
We offer this course daily in the morning and you'll be finished before noon. Everything you need is provided, all you need to bring along is a towel and swimwear. 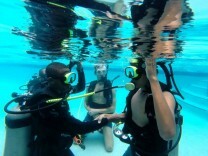 Groups are kept to PADI standards of 4 students or less per Instructor. Certified divers are welcome to join friends or family on this beginner dive. US $110.00 for the initial DSD course which includes all of the equipment use and a great dive on Cheeseburg Reef.